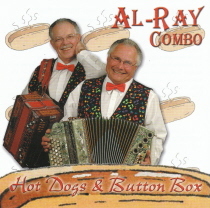 Button Box Accordion Polkas with the Al-Ray Combo! “Hot Dogs & Button Box” is the title of the CD. Havin’ fun with the Al-Ray Combo! The Al-Ray Combo play button box accordion favorites on this CD!